How to do more than just make it through each day with your toddler. 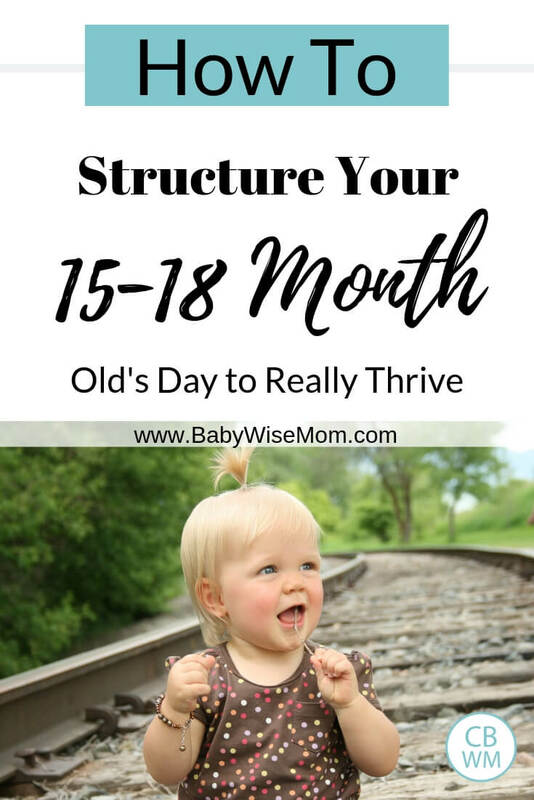 Tips to structure your toddler’s day and really thrive! This is not a time to pat yourself on the back and stop working toward goals. You still have about 17 good years of training your child to put in, so keep working at it! Your toddler might be eating and sleeping well, but that is only a small portion of what you want for your child. The eating and sleeping well are good stepping stones for working on the bigger picture, they are not THE picture. These three months can be really easy or a bit of a challenge. They might be really easy if your toddler sticks to two naps a day. If your toddler moves to three, however, you might find yourself wondering what to do with your child during all of this extra time. 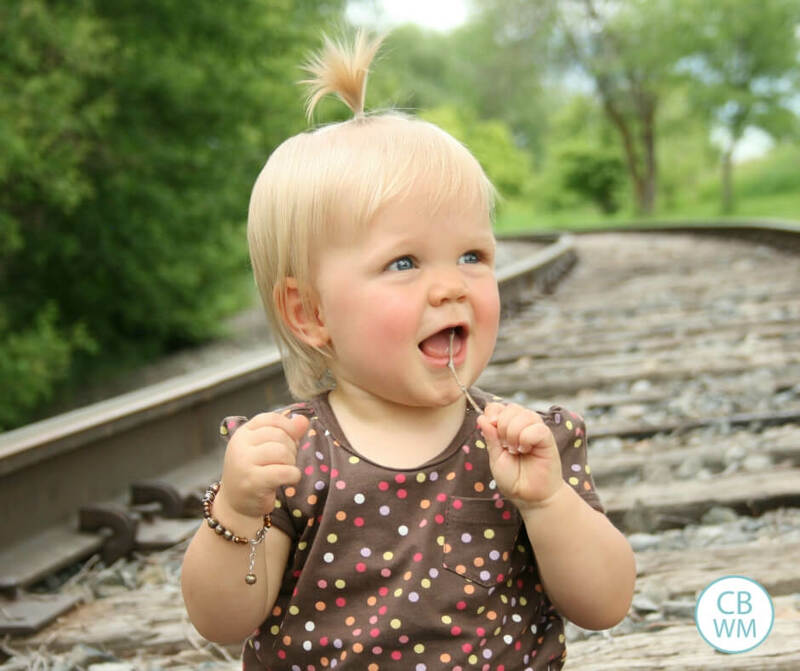 By 15 months old, most toddlers are walking and can say at least one word. I personally love toddlers. They are so fun. Everything around them is so fascinating, and as you spend time with them, you come to see and hear things you hadn’t paid attention to in years. 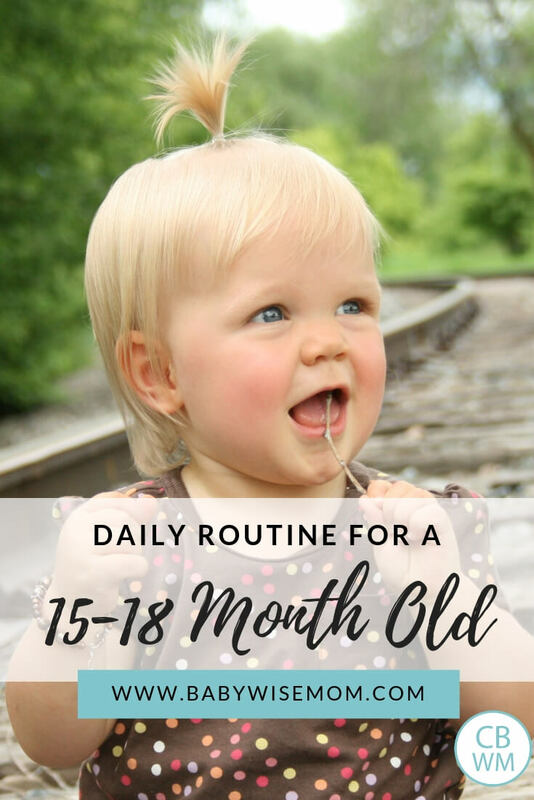 Much of the advice for 15-18 months is the same as 12-15 months. After listing the different activities for the day and special considerations for each activity, I am going to delve into the whys behind the activities to help you keep a focus in mind while you do it. Having a goal to work toward is a big difference between making it through the day and more than making it through the day. Food Amounts: Just because he is now a toddler does not mean you will worry less about his food intake. See Food Amounts for Toddlers for guidance. There is a good chance your toddler will be ready to drop the morning nap during this period. Most drop it around 18 months, though there is a wide range around that. By the end of this range, most will be ready to move to roomtime for independent play rather than playpen time if they haven’t already. And it still isn’t too late to start this if you haven’t already. You allow your child to choose the activity he plays with. That is why it is “free.” He doesn’t get to jump from activity to activity; you want him to learn to have a sustained attention span. But he can have more than one toy available to him during this time. Free playtime can really be any activity the child chooses. Your toddler still needs to be supervised during this playtime. Structured playtime is when Mom decides the activity. This is a good thing for your toddler to learn to accept; in educational settings (and life), we don’t always get to choose what we do. This time can be art, music, puzzles, or other learning activities. The child can work alone or with a parent or sibling (see below). See structured playtime for more. If your toddler has siblings, you can have sibling playtime. This can overlap with other activities if needed. For example, the siblings can both color at the table together for structured playtime. Or maybe they will go outside to play together for outside time. Keep in mind that most 15-18 month olds are not interactive players. They play in tandem. They won’t necessarily play with the older sibling. However, some will. Kaitlyn is very social and would actually play with Brayden during this time. From what I read, it is common for younger siblings to be more socially interactive at an earlier age than the oldest who was an only child. The importance of this activity never diminishes. Continue to be sure to incorporate one-on-one time with each parent each day. This can overlap with structured playtime. Mommy or Daddy can sit at the table with the toddler while he colors and join in the coloring. It can also overlap with other appropriate playtime activities. See my Dates With Kids Post for lots of ideas on what to do together. The older your toddler gets, the more he will enjoy playing with friends. At this age, play is still very much in tandem; they don’t really interactively play with each other. But being in each other’s presence is fun. Be sure you take things at the pace of your individual child. Some toddlers will love jumping in with a bunch of other rowdy toddlers. Others will need some time to get used to the activity and might prefer starting with just one other toddler. It is fun to do activities together as a family. You might go for walks, read books, work in the yard, go out to dinner, take a vacation, go to a museum…the possibilities are endless. Sledding: You can still spend time outside if there is snow. Be sure to dress your child appropriately. I have heard it is a good idea to not allow a child to be out in the cold for longer than 15 minutes at a time, though I have nothing to back that up with. Sandbox: The sandbox is a fun place to play. Mimic: Toddlers love to mimic their parents. If you garden, you might get some gardening toys for your toddler. If you have a lawn to mow, a lawnmower. Bubbles: This is always fascinating for the toddler. You can add some time for the arts. You might dance, sing, and/or draw. It is wonderful to pass on your passion to your children, but also be sure you expose them to arts that aren’t necessarily your interest. For example, I love to sing and I love to dance. It is quite natural for me to expose my children to these items. I am not an artist when it comes to drawing, painting, etc. These are activities I have to make a conscious effort to add to our day because it isn’t a natural interest of mine. As your toddler starts to speak more, it will be easier for this to be a focus for you. Your toddler will demonstrate more and more the vast amount that he understands. You will most likely be quite shocked. We were even shocked with Kaitlyn. Continue to work on language development. Talk Back: When your child talks to you, listen and talk back. Keep in mind the principles from the previous making it through the day post for ages 9-12 months old. Academic Skills: This is teaching ABCs, mathematics, language, reading, and more. Structured playtime and one-on-one time with parents are both excellent points in the day to teach academic skills. You can also learn to work these things in throughout the day. When you are on a walk, you can count how many cars, cats, birds, etc. you see. You can get foam letters for the bathtub and sing the ABCs during bathtime. These skills can always be incorporated into your activities. Remember that people learn line upon line. Teach your child in steps (see learning section above for more about learning). Spiritual Training: This involves anything spiritual that is appropriate to teach your child. This can be teaching to say prayers, which at first is done by the parent showing the example of how to do things. You can read scripture stories and teach about important people in your faith. You want to set age appropriate goals for these areas. Don’t do too many at once; you will only stress yourself and your toddler out. Think of where you want your toddler to be in a few months and work toward that. Your toddler needs direction to get there. For more on goal-setting, see Beliefs and Goals (Toddlerwise) . I have a lot of posts to help you with disciplining your toddler. Here are some of my favorites. I have enjoyed reading your blog and find it to be really helpful! I have a question (not regarding this post).We want to teach our children to honor age by having them refer to adults as “Mr.” and “Mrs.” What do you personally do when they say “Oh, it is okay, they can call me Mary.”. I still tell my children to call them “Mrs. Smith”. Even using “Ms. Mary” makes me cringe. I am struggling with not respecting the other person’s wishes, but would much rather teach my kids to honor age. Hello! Wow, your blog is incredible! I am so happy to have found it, although I wish I had known about it sooner! Our first child is a 10 and 1/2 month old son, who has been a very “easy baby.” I have followed BW strictly since he was about 2 weeks old and believe that it has made all the difference for our family! We are just now encountering some problems. I read BW II again yesterday thinking I might find something I missed the last time, with no luck! Sent my husband to get TW today, but it seems a little early for that one!? He has 8 teeth, just starting to crawl, is BF (with 1/2 BM, 1/2 formula 3 days a week when I work), eats mostly anything we put on his tray (although he has started feeding the dog a piece of food after about every two of his bites). His wake time is generally 6:30, BF then, solids at 8:00ish, nap #1 at 9:00, BF when he wakes up 10:30, solids at noon, and nap#2 at 1:00, solids at 5:00, BF at 6:30 and in bed for the night. In the last week his naps have started being about 35-40 minutes long and has also started waking up in the middle of the night again… once, sometimes twice!Basically, my questions are:1) Am I raising a “snacker?” How should I adjust his feeding schedule as I begin to think about weaning?2) How can I get him to nap longer and sleep through the night again? Someone suggested trying tot drop the first nap, but I feel like he is way too young and he gets really tired. He has been waking up fussy which I know means he isn’t getting enough sleep. Yesterday I left him for an hour and a half, and only about 35 minutes of that was sleeping the rest was fussiness. He used to go down without a fuss at all and wake up 2 hours later happy. Hi! I am a first time commenter, but have stumbled across your blog often and find that you have a fabulous index for us to follow.I was just wondering if you could help me out a bit, I have a 10 month old son and we are in the process of figuring out nap schedules. I have always been a scheduled mom and now he is starting to confuse me. He goes to bed by 8:00-8:30 and sleeps till 8 ish in the morning. I BFeed him and then it’s play time. I try to get him down for a nap around 10 ish, at times it works, other times he plays in his crib for an hour before he falls asleep. By the time he wakes up it’s noon. I give him a bottle, lunch and then we play for 2 hours or so. He starts his afternoon nap anywhere around 2:00 and then after that, he doesn’t nap anymore. My question is, is that if he pushes his morning nap so long, does he still need it? I have a lot of friends telling me that he doesn’t need one in the morning anymore, but he’s only 10 months, I don’t think he could survive on just one afternoon nap. I was wondering if you could give me a sample schedule for him. I nurse him morning and before bed and then he gets 3 5oz bottles per day.Thank you so much! McDowells,Thanks! I am glad you enjoy the blog.This is a hard call. Personally, I would do one of two things. My first inclination is to have the child call that adult by what the adult wants to be called by. I think that is showing the adult respect. I feel this way just because I prefer to be called by my first name, not my last. Children are smart enough to know the difference between who they can refer to as Mrs. and Mary.But I also see your desire to have your children use Mr./Mrs. etc. If you feel really strongly about it, I would say something like, “I really prefer they call you Mrs. Smith. I think it is less confusing for them if they have one format for addressing adults. Would it be offensive to you if they called you Mrs. Smith instead of Mary?” Most people probably won’t really care. Just be honest about why you are doing it and I think people will be fine with it. Heidi,TW isn’t meant until 12 months old. But they also just released a pre-toddlerwise for ages 12-18 months. I think it is a good idea to read these before your child is at the age so you can be looking forward.With BW, you feed solids at the same time you breastfeed. You are doing things the way the Baby Whisperer suggests. Personally, I think it makes more sense to feed solids at the same time as breastfeeding.I wouldn’t drop the morning nap yet. I would work with his waketime length. He likely needs it a little longer. Wenona,Since he is napping well for both naps, I wouldn’t worry about it. One thing I would do is decide on a time to get him up and then get him up even if he took a while to go to sleep. Kaitlyn slept until 11:30 and woke at 7:30, so your son is on the same type of schedule, just a half our behind. I think it is just fine. I wouldn’t drop the nap until 14 months at the earliest.